On this date in 1971 jazz pianist Wynton Kelly died at age 39 of a seizure. Here he is with Miles Davis and John Coltrane performing “So What”. This entry was posted in Anniversaries, Video on April 12, 2010 by Michael Happy. Nella Cotrupi‘s talk to the Frye Festival in 2002. It is cross-posted in the journal’s Frye Archive here. Mesdames et messieurs, ladies and gentlemen, it was with real pleasure that I accepted M. Lemond’s invitation to speak to you today about a man whose visionary faith and potent words profoundly touched and changed my life, as he has the lives of so many others. Northrop Frye’s reputation continues to rest primarily on his prodigious output in the realm of literary criticism and theory. Today, however, I want to invite you to explore with me the driving force that fuelled his work as a literary critic and teacher, and that has made his ideas so compelling, not just for those on the literary and critical path, but for thinking and socially-concerned people around the globe. My talk will focus on Frye’s spiritual quest, on his unique, unconventional version of Christianity, and on some of the spiritual and philosophical traditions from which he drew inspiration and, dare I say it, hope. But first, I want to tell you a story. Appropriate, I think, considering the occasion. This is a real life story about a committed young lawyer and activist who decided in the early years of her marriage to take some time away from her professional activities to look after her young children. Those days in the early 1980s were exciting and heady ones for a newly minted lawyer whose work revolved around law reform and advocacy for injured workers in Ontario. Granted, many of these workers were men and women with whom she felt a deep affinity, being, like her parents, immigrants, workers of Italian origin employed in manufacturing, and construction—working long hours in often dangerous conditions and unsavoury surroundings. They were people determined to move forward, often at great cost, physical and otherwise, to themselves, in order to bring other options and possibilities to their children. And there were other clients too—all with similar dreams and aspirations—workers from the Caribbean, Portugal, and South America, Europeans and Asians from many lands and even a few Canadians whose history freed them from the need for hyphenation. All of them were hungry for the opportunities promised by this immense northern land, and all of them shattered by the possibility that the hard-won morsel of hope for a better life might suddenly be snatched from them by the physical and other injuries they had sustained. To leave this work and vocation, even for a temporary sabbatical, was a difficult call to make. And yet, the value system was deeply ingrained and the family priorities won out. A leave was arranged, an application sent out for a part-time MA to keep the brain from getting too flaccid with diaper changes and baby talk and well, you can probably guess the rest. She walked into room 114 Northrop Frye Hall at Victoria College to sit in on Frye’s Bible lectures and she has never really walked out. Suddenly those persistent, suppressed, impractical preoccupations which had haunted her since childhood were given legitimacy and a most articulate voice. So too were those emotions that had driven her as a child to try to capture in words, or with paint and brush the quiet majesty of the Laurentians, the heart-aching sunsets over northern Ontario lakes with their frame of wind-tossed pines, the hard cold beauty of star-filled winter skies over Nipissing, and even, on occasion, the harsh beauty of Calabria’s mountains. She was free to confront these compulsions now and to ask: Why had she felt moved by these vistas to the innermost core of her being, why compelled to capture and hold the intensity of the moment and what, just what, was one to do with such powerful experiences? 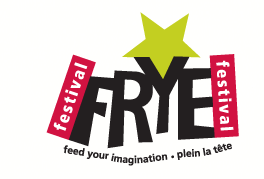 This entry was posted in Frye Festival, Journal on April 12, 2010 by Michael Happy.